It is 1453. Constantinople has fallen and the world is changing beyond all recognition. Uneducated and filled with superstitious fears, people are seeing evidence of the end times everywhere they look. Luca Vero, a member of the mysterious Order of Darkness, is charged with heading out into the world and investigating these reports of signs pointing to the end of the world. Luca is accompanied by scribe Brother Peter and his friend and servant Frieze as well as two young women, Lady Isolde and Ishraq. Together they witness an apparent prophesy of hope and hear the call to join a children’s crusade. The leader of the crusade, Johann, claims that God has called him to march to Jerusalem promising to part the sea to allow the children to march there directly. Confused but finding it difficult to resist the charismatic leader and his apparent message from God, Luca and his companions find themselves drawn into the crusade until disaster strikes, leaving them to deal with the aftermath of Johann’s misguided faith and the grief and superstitions of the local people. 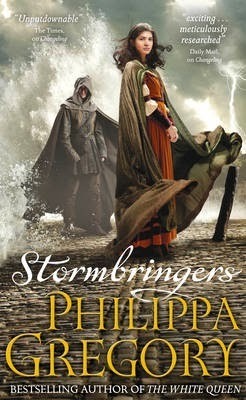 Stormbringers is the second book in the Order of Darkness, a young adult historical fiction series by bestselling author Philippa Gregory. Having introduced the characters in the first book, Changeling (KBR review here), Gregory now focuses on one specific event to highlight the fears and beliefs of mediaeval Europe and uses this to further develop the characters and fill in a little more detail about the Order of Darkness and its mysterious leader. I found certain aspects of Stormbringers quite fascinating. The story of the children’s crusade and its awful fate led me to search for more information on such historical events online. Unlike Gregory’s adult novels, the Order of Darkness stories are an amalgamation of events and people from the time in which the story is set (mid 1400s), rather than focusing on a specific, documented historical figure. They are nevertheless subject to Gregory’s thorough research and I had little trouble finding information that could have inspired the events in the story. I did find that Stormbringers seemed to drag a little compared with Changeling, but this is perhaps because it focuses on one specific event, rather than the several issues that are addressed in the first novel. I did, however, enjoy the additional background information about the Order of Darkness and I was challenged once again by the realisation of how frightening and mysterious the world must have seemed to people of the time who didn’t have the benefit of our knowledge of the various scientific disciplines. Once again, I found Ishraq to be the character that interested me the most and I’m looking forward to reading more about her character and background in future novels in the series. The Order of Darkness books are sure to fascinate teen and adult readers with an interest in mediaeval history, particularly the era of the crusades. The third book in the series, Fool’s Gold, was published in February 2014. There is a Reading Group Guide available for this novel.